Here we'll cover what BASH is, some basic BASH usage, and point you toward what you need to learn to configure BASH and customise the prompt. 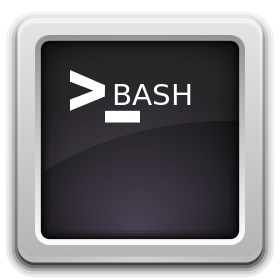 BASH is a shell (The name stands for Bourne Again Shell which refers to one of its predecessors, the Bourne Shell). A shell is the software which parses the commands and instructions that you enter at the prompt of your terminal or virtual console, then runs them on your behalf. How Does BASH Know About Commands/Programs/Utilities? This will show you exactly what paths are searched for what's available on your system. As you can see, each of the paths is delimited (separated) by a colon. So with a PATH variable like this one, when you run a command the first place the shell checks for the existence of the command is "/usr/local/sbin". If its not found there, then it checks "/usr/local/bin" and so on. You can add paths to your PATH variable by editing ~/.profile. There's more on the topic of configuring bash in the next section. Note that if you do add your own changes to the PATH variable, its considered good practice not to put a "." (current directory) on the list of paths to search, especially if its for root's PATH. And for users other than root, if you must put a "." in the path, put it last so that the normal command locations are searched before the current directory. We cover configuring bash in more detail here, but for now we'll just mention that the files ~/.profile and ~/.bashrc can be used to configure your shell (The first is run at initial login, the second is run when a new instance of /bin/bash is started). We'll discuss environment variables that affect specific programs in their relevant posts. For now the main ones to know about are: PATH (which we mention above) and PS1 which is used for customising the command prompt which we'll point you toward below. If you'd like to tweak the shell prompt displayed in your terminal, you'll need to change the PS1 environment variable. For example, you may wish to include the date and time in the prompt. Note that using single quotes is important here otherwise the string you set will be interpreted by the shell before being set, thus setting a string other than what you intend! To change it permanently, you would need to add the substring to your PS1 variable in ~/.bashrc file. We'll cover customising this prompt and others in more detail in a future post. tells us that the underlying ls is an external command /bin/ls. Note that some commands will have a built-in and an external version of the command. To help you become more productive when using the command line, please refer to the list of bash shortcuts in this post. Linux sends all output to a file. Even the screen (where your shell prompt is) is considered a file. Unless a program or command redirects output, it is send to a special file called "standard output". By default, this represented by the screen. Similarly, errors from a program are sent to "standard error" which by default is also represented by the screen. The symbol "&1" can be used to represent standard output, while "&2" represents standard error. There is also an "&0" which represents standard input. So you can consider &1 and &2 as locations where you can send data, while &0 is a location you can get data from. As you'll see shortly, you can redirect standard input and output to places other than these and even make the data vanish if need be. Note that if the file out.txt does not exist, it will be created. If it does exist it will be overwritten (clobbered). where we basically just redirect standard output using ">", and then send errors to the location of standard output (remember &1 mentioned earlier?) which we've set to be output.txt. will pass the last 100 lines from the file file.txt to the less command so you can easily scroll up and down the resulting lines. You can send any sort of data to the special file /dev/null, which is like a black hole, so the data ends up disappearing forever. (where some_command is whatever command you need to run). If you need to display or save output to file and also send that output to another command at the same time, you can use the "tee" command. Had you noticed that doing an ls on your home directory doesn't show any files that begin with a dot such as .bashrc or .profile ? Note that using hidden files such as these are just to help keep your directories free from clutter and are nothing to do with security! Putting one or more commands that perform a specific job/task into a file for future use is pretty common. Such a file can be referred to as a bash script, and would have the extension ".sh", so myjob.sh could be an example of what you might call such a script. Bash also provides looping and control structures for your use, much in the same way as a conventional programming language. Hence bash scripting can be considered as being in the category of programming. BASH scripting is beyond the scope of this post, but we shall be covering the topic at some stage in the future. Thanks to Brian Fox and Chet Ramey for implementing BASH.